Defining the law as of randomness by Charles Seife in Edge.org 2011 question is good food for thought. The First Law of Randomness: There is such a thing as randomness. We are not able to predict everything. We may look for patterns as part of being human but sometimes there just is not a pattern. Randomness exists. The Second Law of Randomness: Some events are impossible to predict. we can try to handicap an event, but there are events that are difficult to predict and there are events that are almost impossible to predict. There are unknown unknowns. The only thing we can do is try and protect enough to make sure that some unpredictable event cannot lead to ruin. The law of large numbers will always work. If we have enough events, we can make predictions in the aggregate but not about a specific event. I can predict the likelihood of an event like the roll of a dice, but not the actual number of the next roll. The World Bank through the IFC its investment arm is taking a 6% stake in the Armajaro cocoa trading house. It will also lend firm $55 million in mezzanine debt. Is this supposed to help poor farmers? This seems to have some murky reasoning if the firm is supposed to still be a profit maximizer. If they have an opportunity for a quick profit from driving prices lower should they still take it? The conflict of interest or the potential to be on the wrong side of a pricing issue as defined by what is best for farmers is high. Is this better than a marketing board? What if the trading firm is in conflict with a country's marketing board? The change for confusion is extremely high. Creditability like trust is often elusive. Once it is lost, it is hard to regain. 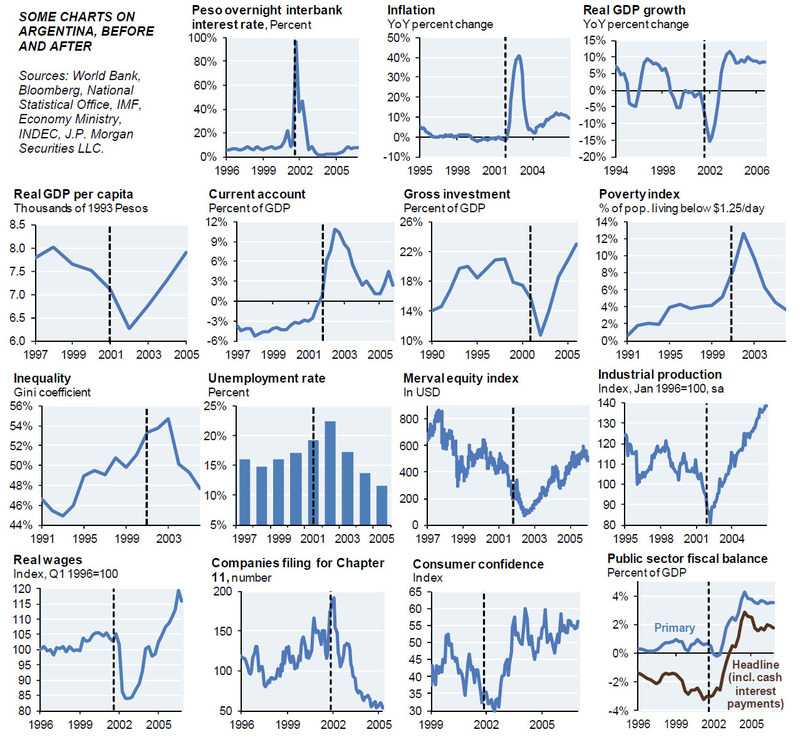 The EU, UK, Japan and US governments are losing creditability and prices suggest that little they say can get it back. The lack of creditability means that investors will not commit for any length of time to an investment program. The animal spirits of optimism cannot work. The EU may have the biggest creditability problem. If they stick to their commitments of austerity, they will be voted out of office. Hence, with each election there will be less creditability. Any compromise with voters causes a pull-back from any existing policies, so there is little that can be done to show creditability. The government cannot be trusted, or they can be trusted not to follow-through on their plans once faced with opposition. So is there a solution? A workable solution is an attempt at fiscal flexibility through short-term spending or investment subject to pre-commitment to future cuts. This has been tried but has not be successful at giving voters clarity of the choices. The fiscal flexibility approach means borrowing more at low rates. It also means flexibility at cutting expenditures on some programs while spending more on job creation. Entitlement cuts with government investing could work, if there is a framing of cuts to long-term programs in exchange for shorter-term job creation and growth. In Europe, the creditability problem is more structural and requires even more work. The structure does not allow for strong policy choices. In fact, because the US does not have structural problems with federalist government, it should be able to overcome the problems of creditability more easily. There is a strong distinction between commodity futures investing and investing in equities associated with commodities. Specifically, there are differences in the type of firms that are associated with commodities. We classify four types of commodity equities firms. Classifying firms into different types of commodity equities helps provide context to the sensitivity of equities with the underlying commodity. Producer equities - mining or exploration and pure production or extraction companies. These are the firms that mine, explore, produce or extract a commodity. There will be a close link between the price of the commodity and value of the equity. Value is determined by the difference between price and marginal cost times the production and level of reserves at the company. Price increases will lead to higher value. The difference in value increase across firms will be related to the marginal cost of production. Low cost producers will see a larger gain than high cost producers. The value will also be determined by the distance between the price and marginal costs. If there p[rice increase will lead a company from a loss to a gain because the price is now above the cost of production, there may be a greater change in value. This can be called the optionality of producer firms. The simple fair value will be the discounted present value of future earnings. Producers in mining and energy E&P are, however, not infinite lived companies. The resource or production is exhausted over time, so the value is a combination of price minus marginal cost times the amount that will be extracted each year. Nevertheless, the life of the equity producer is greater than that of a commodity futures. The value will have to discount future production not by the current price but by the stream of expected future prices. If the futures is an unbiased estimate of future prices, there value of the firm will be affected by distant futures prices more so than nearby futures prices. The producer company will have characteristics of a bond because the cash flows are limited so the discounting has a finite life. There is also the potential for more leverage based on operating margins versus a futures contract. Like all equities, the company value is an option. Hence the value of the firm will be affected by volatility. There is no reason to believe that a one percent change in the nearby futures price of oil will lead to a one percent change in the price of oil exploration company; consequently, the link between equities and futures should not be expected to be strong. Intermediary or (refiner/processor) equities - firms like Bunge or ADM which are involved in a form of arbitrage would fall into this category. Let's take the simple example of ADM which is in the soybean processing business and ethanol business. In the case of soybean processing, an increase in the price of soybeans may not lead to an increase in margins associated with the soybean crush. The crush arbitrage may show a better link with ADM than soybean prices. The demand for meal and oil, while tied with the price of soybeans, will not move in lockstep with the underlying commodity; consequently, there could easily be a decrease in the price of ADM when there is an increase in the price of soybeans. The same could be said for corn and ethanol production. The price of corn my change, but that does not mean there will a similar change in the margin from processing ethanol. Ethanol prices will be associated with gasoline demand as well as corn prices. Now the profitability will be associated with the margins for certain arbitrage, but the link between commodity prices and stocks prices for these types of firms may be weak or contrary to the general direction of futures prices. Commodity retail equities - firms that engage in the selling of commodities to end users. This type could include food companies which use agricultural inputs in their production process or gasoline retailers. An increase in the price of inputs like corn or sugar or cotton may have a negative impact on profits since the value of the firm will decrease if there is an increase in the cost of production. However, the cost of the input may actually be a small relative to the cost of marketing, so the link between commodity prices and commodity equities on the retail level may be weak. Accessory equities - firms that sell to commodity companies. This would include firms like Monsanto, the seed company or Caterpillar which sells farm equipment. Another example may be oil services companies which provide services to the producer. In these cases, the price of the equity will be associated with the level of wealth or earnings of the firms that would buy the services of the accessory companies. These firms will not be sensitive to short-term prices which do not change the level of wealth of a farmer of service buyer. If there is longer-term change in prices, there will be a boost in the commodity equity, but the link will only exist if there is a longer-term sustained gain in price. Of course, firms that hedge will mitigate any of the change in price associated with a commodity. For example, airlines could be thought of in the retail space. they convert energy to transport and use oil as in input. If there is a hedging program, there will be less sensitivity to oil in the short-run. Look at the up trend in natural gas volatility. It is a new world and it is more uncertain. The lower price for natural gas means there will be more switching between gas and coal. Demand for gas right now is more uncertain and may be more sensitive to changes in weather which will drive peak demand. It is also more uncertain what will be the supply outlook. There is the expectation that supply will decrease but there is more uncertainty on when and how much. Natural gas may be a key market to watch because there will be the higher degree of uncertainty. Information events will lead to strong changes in price. These events may have even greater impact if it is during non-trading hours. It can have especially negative impact for trading and liquidity if the main market is closed but there are secondary OTC markets which may be open. This has been the case for grain markets which are closed during the key period surrounding USDA announcements. The USDA announcements are especially important because there are much fewer announcements in the grain markets than in fixed income or equity markets which receive information from numerous sources. The closed markets mean that there is no price discovery during an critical period. Those who have future hedges will have to wait for the open and sit with the potential risk of not knowing the price during critical post-announcement period. The CME, by allowing pit trading pre and post the USDA announcements will help the market determine price and allow all market participants to have access to liquidity during a key announcement period. This is a good market structure move. Prices are still the best medicine for solving problems of supply and demand; however, the link between a price move and the impact on supply and demand is not always clear or immediate. In the case of oil, higher prices have led to more rigs being employed. Higher prices will lead to higher inventories. Demand will fall when prices are higher as users ration. US rig usage is the highest in decades. The same applies to inventories. The response is not always immediate as capital decisions take time, but the eventual impact is and will be clear, prices will fall. Will power is an important skill and it can be measured early. There have been a set of well-known experiments to test the will power of small children. The child is placed in a room with a marshmallow or some other treat. The child is told that if he can hold out for a set amount of time he will get two marshmallows. The question is whether the child can engage in delayed gratification. Films show that for many the idea of waiting for your treat is a real problem. Yet, there are others who seem to be able to achieve the goal of waiting. More importantly than seeing difference in children is determining what is the impact of those who show will-power later in life and how is the will power achieved. Tracking those which showed will power suggested that this talent was a key to future success. Those children who waited longest were able to achieve higher test scores later in life. Some have argued that this shows how the conscious mind can control the subconscious. Others state that this will power provides insight in the time value discounting of individuals and how individuals invest in longer-term goals. The Mischel or Stanford Marshmallow experiments attempt to measure will power, but a closer observation concluded that more was going on with the kids. The kids actually engaged in a behavior to actively ignore the treat. They tried to refocus on other activities in order to forget about the treat within their reach. What was concluded is that the kids engaged in a strategic allocation of their attention. This strategic allocation to attention whether for or against some goal was the form of will power being employed. In trading and the rest of life, it may be the strategic allocation of attention which drives success not will power. Those who are able to concentrate or block out noise or irrelevant information may be more able to deal with complex markets than those who have less attention.The idea of allocation to attention may be more descriptive of will power behavior. There is a skill with adapting to information overload. Those that can block excessive or useless information will be more successful than those that are easily distracted or who cannot process large amount of information. Perhaps a key character trait of successful individuals is not so much what is used but what is ignored? Accepting more responsibility for success than for failure, for good deeds than bad. This sums up the self-serving bias which we all face. One of the keys for determining the quality of a trader is whether there is a strong self-serving bias. It is almost impossible to be a good trader when having this bias. Ego is needed, but a candid skill assessment is more important. Brazil has been one of the biggest currency mercantilists. It has clearly tried to force their currency lower in order to make their exports cheaper. It have jaw-boned the markets with rhetoric concerning their currency being too high. Brazil has made it clear that there is a "currency war" and the policies for lowering the dollar is not something they would like to see. Brazil has followed aggressive policies to have money not flow into the real. Capital controls, taxes, and financial rhetoric have all been used. These polices have been generally effective, but the latest round of risk-off trading has caused a rout in the real. Much of this sell-off in Brazil is related to forecasts of slower growth. The shine in BRIC's has fallen with commodity prices.This is not what Brazil wants. It wants to be wanted and is now angered that investors want to sell the real. So now the currency move has gone too far and the central bank has started to use swaps auctions to raise the value of the real. The central bank bought $7.2 billion last month and has been active again in the swaps market. Mexico has followed a similar policy and has sold dollars the first time since 2009. You may get what you wish but the effects of a weak currency can also be a negative. What central bankers want is control and that is often the most difficult policy goal to achieve. Investors often use the argument that there is no need to hold commodity futures because you can get the same general commodity exposure from equity markets. Unfortunately, the exposures in commodity futures are not the same as exposures in commodity equities. The differences are mainly with the timing of price moves. Commodity futures will represent the short-term supply and demand for a commodity conditional on the current inventory situation. The futures market is associated with a contract that has a specific expiration. Hence, it has to reflect the impact on price to that expiration date. Commodity equities, if they are true commodity equities and related to the production of a commodity, will represent the combination of discounted present value of reserves held by the company and the discounted earnings as measured by the difference between future price and marginal cost of production. Unfortunately, many define commodity equity companies with a much broader definition to include commodity intermediaries. There can be short-term factors which cause commodity futures to move while there is a little movement in commodity stocks. This will be especially the case if a price move is expected to be temporary. For example, there can be a temporary short-term shock which can effect futures which will not cause a change in the valuation of the equity which is discounting long-term cash flows. The stock will move with short-term price changes, but the value of the firm will be associated with the long-term price at which the commodity can be sold after it is extracted. The Samuelson price effect states that nearby futures prices will be more volatile than more distant futures. Similarly, the futures will be effected by inventory risk premium or changes in the convenience yield. These short-term disturbances will not effect the long-term discounting of reserves. Equities are also inherently an option and will be valued by the long-term volatility and the amount of in-the-moneyness. Hence, the risk factor or volatility of the nearby futures will be driven by different variables than from the long-term price. Equities can be affected by a set of factors which will not be expressed in the futures market, firm or industry specific risks. These firm specific risks can be diversified away through holding a broader portfolio within the industry, but they still exist. These can represent opportunities which are different from futures markets. For example, the recent nationalization of oil production in Argentina. Argentine took control of YPF on April 16, seizing 51 percent of the company’s shares from Spain’s Repsol YPF. YPF has since been under government oversight until a general shareholder's meeting names new management. These types of firm governance regulatory risks can be diversified away in larger portfolio but will still have an impact on investors. This impact on oil prices was minimal as measured through the futures market. There can also be common short-term factors such as a mining disaster or a strike that will affect individual companies and can also have an effect on general prices. There can be a trade-off between long-term and short-term risks hence there can be a place for both commodity futures and equities, by these are not perfect substitutes within the real asset space. The simple truth is that most of what anyone thinks about economics models will prove to be wrong. This does not mean that the basic "laws" of supply and demand will be wrong, but the models that try and explain economic phenomena will usually end up being revised or thrown out over time. Most scientific theories are proved wrong. Karl Popper would state that we cannot prove anything, we can only falsify. Hence, much of what we take for granted will prove to be false. If this is the case, we should anticipate the fact that we will be facing much more uncertainty from modeling when we are in a period of upheaval. It is not just the variables that are uncertain, but the model itself. Beware of any thoughts of certainty. There has been a sea change in the behavior of the euro with the EU elections earlier in the month. Forget about the politics and focus on what happens when there is an end of austerity in the EU. The Euro actions seems justified. First, governments cannot provide a solution to austerity unless there is strong support from the monetary authority. Second, to solve the debt problem that will come with less austerity the central bank will be required to generate more inflation. The result will be more money in the system without a structural change in government behavior. The impact on the currency will be clear, a decline from the higher expected inflation. The Euro will only strengthen if there is a movement back to austerity. What will happen if there is a Greece exit from the euro? We do not know because it has not happen before. This is why we need to develop a gedankenexperiment on what different institutions or players may do under this event. The thought experiment seems like a good approach to anticipate actions and responses. The thought experiment is not easy because so many actions cannot be anticipated, but the process of thinking through the logic of an event will give any investor an edge. We can assume that consumers and investors will act rationally and try to profit maximize. We can also expect that there will be a shortage of good information which will increase the likelihood that there will be more herding behavior by all. If this is the case, we should see a run on all of the local banks. A depositor will want to gain hard currency before the announcement. So a good tip on whether there will be an exit is through watching bank deposits. We are already seeing the outflow of deposits. Government officials will also expect this, so we should see an increase in the announcements for calm. We will also realize that the announcement will be a surprise. Companies will try an move cash offshore. All of this suggests that the exit may turn into a self-fulfilling prophecy. The thought experiment will turn into a nightmare very quickly. There is a marked difference between inflation in the G10 and the rest of the world. 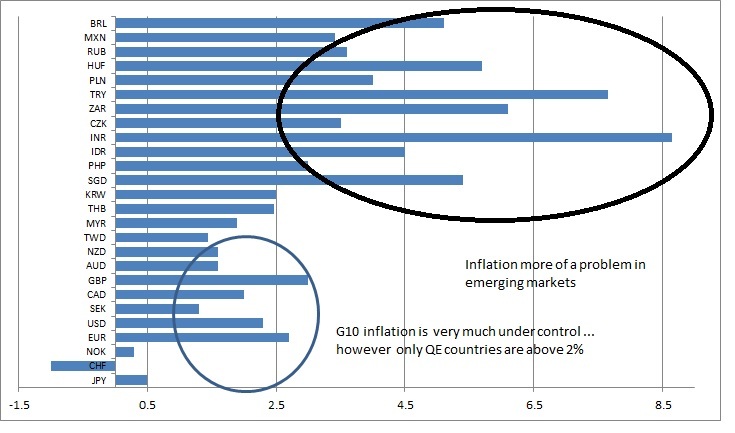 This has usually been the case with inflation in emerging markets generally running higher than in the G10. What is notable is that most of the quantitative easing has been in the G10, but inflation seems to be one of the chief exports of the developed world to the emerging markets. 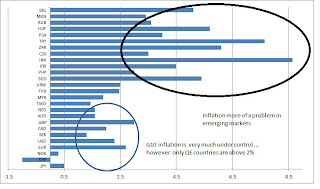 More importantly, there is a significant difference between the inflation rates in G10 countries which have engaged in QE versus those that did not. The highest inflation rates are in US, UK, and EU which have all been quantitative easers. Still the data suggests that there could be room for more quantitative easing for the simple fact that the inflation rates are close to 2% percent which is the rate chosen by many central bankers as the long-term inflation target. Inflation slightly higher than the 2% target may be viewed as a small price to pay relative to the cost of lower output growth. If these numbers come down, we can expect that there will be more quantitative easing. A simple comparison shows that the DJUBS index has tracked closely with Euro Stoxx 50 index and not with the S&P 500. The macro risks from Greece have weighed heavily on commodity markets, so the link with euro stocks is strong and has been growing. During the first part of the 2011, commodity markets were closely linked to the S&P 500, but there has now been a switch to a lower correlation with the US and a higher correlation with Europe. During the first half of 2011, the correlation with the S&P 500 was above .9, now the correlation is below .2 The correlation with Euro Stoxx index was .7 during the first half of 2011 and is currently at .8. The exception was the beginning of 2012 when commodities were moving to expectations concerning the Chinese economy and there was little correlation with wither stock market. We humans are terrible at dealing with probability. We are not merely bad at it, but seem hardwired to be incompetent, in spite of the fact that we encounter innumerable circumstances every day which depend on accurate probabilistic calculations for our well being. This incompetence is reflected in our language, in which the common words used to convey likelihood are "probably" and "usually" — vaguely implying a 50% to 100% chance. Going beyond crude expression requires awkwardly geeky phrasing, such as "with 70% certainty,"
So how do we use the right language for probability when talking about investments? This seems to be one of the most difficult problems with discussing investment decisions. How is uncertainty conveyed to others? What is a likely scenario? There is much work done on looking at the mathematics of uncertainty, bu the language is still the most important method of providing information on risk. One could argue that our ability to even place this information on paper is limited. The visual display of information may be in the form of a volatility but this does not give much precision on how uncertain choices. Causality itself is an evolved conceptual tool that simplifies, schematizes, and focuses our representation of situations. This cognitive machinery guides us to think in terms of the cause — of an outcome having a single cause. Yet for enlarged understanding, it is more accurate to represent outcomes as caused by an intersection or nexus of factors (including the absence of precluding conditions). In War and Peace, Tolstoy asks "When an apple ripens and falls, why does it fall? Because of its attraction to the earth, because its stem withers, because it is dried by the sun, because it grows heavier, because the wind shakes it….?" — with little effort any modern scientist could extend Tolstoy's list endlessly. We evolved, however, as cognitively improvisational tool-users, dependent on identifying actions we could take that lead to immediate payoffs. So, our minds evolved to represent situations in a way that highlighted the element in the nexus that we could manipulate to bring about a favored outcome. Elements in the situation that remained stable and that we could not change (like gravity or human nature) were left out of our representation of causes. Similarly, variable factors in the nexus (like the wind blowing) that we could not control, but that predicted an outcome (the apple falling), were also useful to represent as causes, in order to prepare ourselves to exploit opportunities or avoid dangers. So the reality of the causal nexus is cognitively ignored in favor of the cartoon of single causes. Nexus causality, moral warfare and misattribution arbitrage. This is an interesting thought on on how we think and what we may need to do to think better. We are always looking for a single cause. The golden explanation. We want to have one factor which can explain everything, but the world is much more complex. How many times to we fall into the trap of trying to find a single cause that can explain the movement of an asset? In reality, the percentage explained by even a set of factors is small relative to the total variability of the asset. The setting makes a difference. The competitors make a difference. This does not mean we should not try to find a cause, but it will usually be a set of reasons and not just one event or cause that will make an asset move. The Euro crisis just will not go away. This Greece crisis has been present for almost three years. The start of the Greek problem may have preceded its entry into the Euro. European voters are speaking and they do not want austerity especially if there is no known end in sight from the cost of paying bills. The Greeks do not want austerity, and they do not want to pay their bills. Greek tax collections which were expected to fill their Treasury are not following projections. The Greeks are acting like any consumer deep in debt and not able to make payments. They want to declare bankruptcy because it is the only choice available. The French do not want austerity and voted for a socialist. The Spanish cannot afford austerity and are leaving the country. All are looking for a new choice with less pain. The ECB may be able to provide more liquidity but this does not solve the fiscal problem. Europe needs to have more inflation and needs to restructure and the Euro is more broken than any time in the last three years. It si hard to be a euro buyer until a clear union solution is provided. There is a growing view that Greece will have to exit the euro. GREXIT is the word now being used for a Greece exit. Following this path of reasoning, there is a growing view that maybe this will not be that bad for the Greeks. 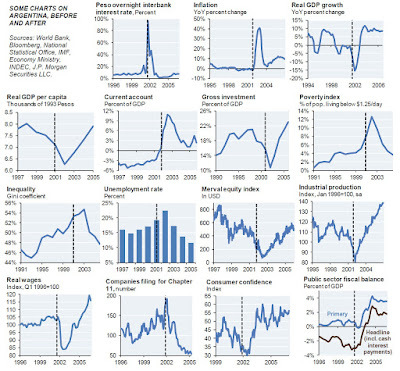 The example of Argentina went through a large default is being used as the example of a success story, (see zero hedge.) Unfortunately, Argentina at least had good that he would trade in the market. This is not the case for Greece which has no goods to trade except for tourism. The impact of a Greece failure are significant because of the potential contagion. Still, what was thought as impossible is now being thought of as a real choice. David Brooks, NYTimes "The two economies"
Productivity will also increase from the increased competition; however, non-traded good will not be unaffected by world prices. The US, given its size, is not an open economy. It is becoming more open, but the size of the traded sector is smaller than most countries. Non-traded goods will be less sensitive to global productivity shifts. Hyper-competitive markets will not generate more profits. By definition, these are markets which will have less profits. There is a constant trade-off between the impact of macroeconomic views and short-term logistics in the oil market. Traders will often place positions based on the oil fundamentals only to be hurt when there is a switch to macroeconomic such as the risk-off view of the last week. Greek elections drive the oil market one week and the pattern of supply will drive it the next week. Last month the Saudis have announced that they have contracted for 11VLCC tankers to take 22 mmb of oil to the US in an effort to show that they want to stabilize the price of oil. The reaction in the market was a swift decline in price. The decline in price is also suggestive of the importance of oil logistics. The moving of oil from one location to another will have a significant effect on price in the short-run. 22 mmb is just a small amount of oil but it can flood a location and cause a price difference. Success in commodity trading is based on understanding how to make this trade-of between the macroeconomic and microeconomic effects of markets. The macro risks need to be managed for the downside and the micro fundamentals need to be focus of profit generation. This may represent all that is wrong with the current environment between governments and markets. Governments want to control markets which are often messy and hard to contain. What is the purpose of government if they cannot control? What is the success of any policy if it has to take its lead from the markets. The objective of policy-makers is to stop markets from signalling what is rally at risk. Perhaps this is the problem with some of these complex hedges from banks or the best laid plans by policy-makers. The human element cannot always be measured. Correlations are not stale. Curves change. Liquidity changes. There are many factors which drive performance and design has to account for the fact that mistakes are made and the unexpected is the norm. Brazil is the second largest soybean export and third largest corn exporter. Its capital needs for infrastructure are huge, but the Brazilian government wants to place restriction on who can own land. There is a current ban on private investors buying large tracts of land. A new law is supposed to further restrict the buying of land by foreigners, especially Chinese who want to secure a source for soybeans. State-owned companies, SWF, and non-governmental organization would be banned while private transactions would be reviewed on a case by case basis. It is important to control resources, but this type of restriction may cause capital to move elsewhere and limit the expansion of a key growing area. The result will be higher prices.